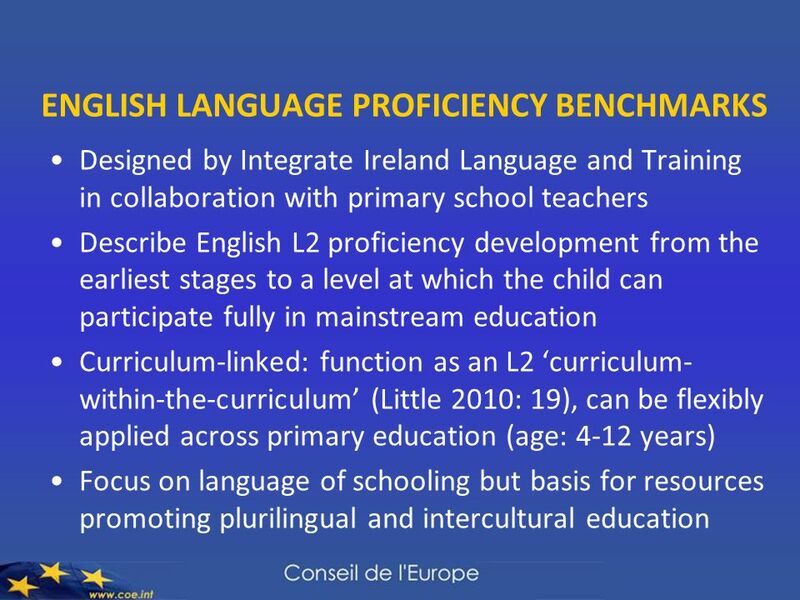 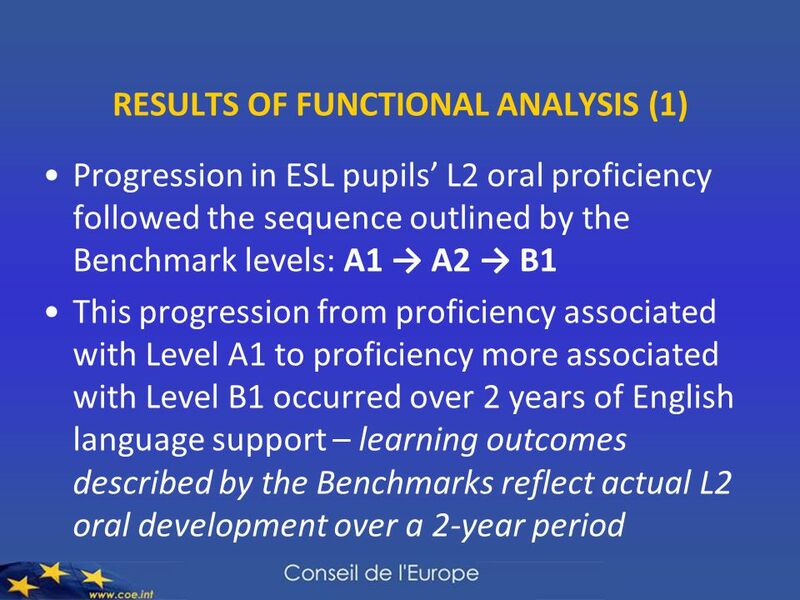 DEVELOPING ‘ACADEMIC LANGUAGE’ FROM PRIMARY TO SECONDARY EDUCATION THE ENGLISH LANGUAGE PROFICIENCY BENCHMARKS IN IRISH PRIMARY SCHOOLS Bronagh Ćatibušić. 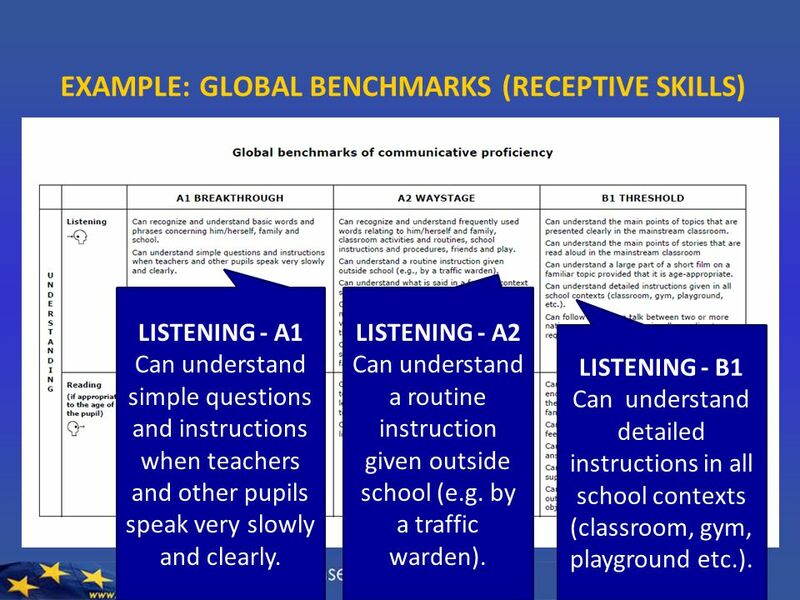 8 EXAMPLE: GLOBAL BENCHMARKS (RECEPTIVE SKILLS) LISTENING - A1 Can understand simple questions and instructions when teachers and other pupils speak very slowly and clearly. 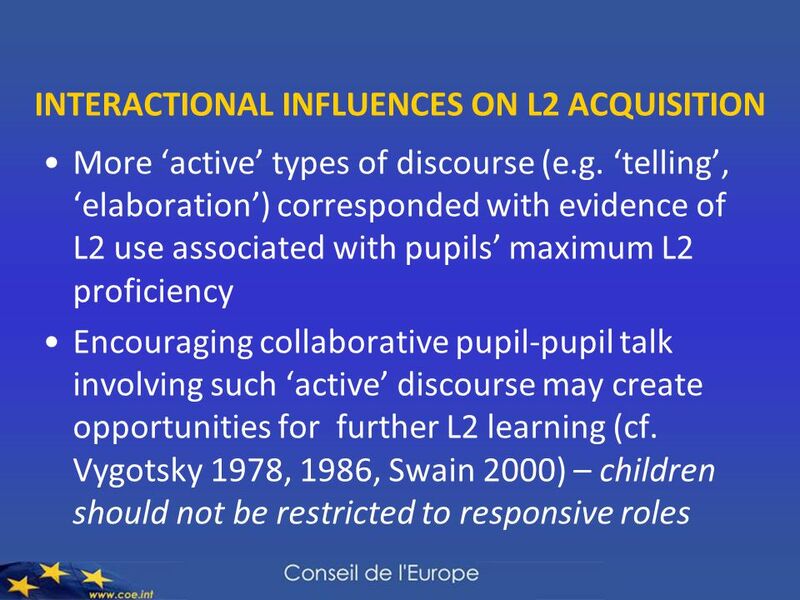 LISTENING - A2 Can understand a routine instruction given outside school (e.g. 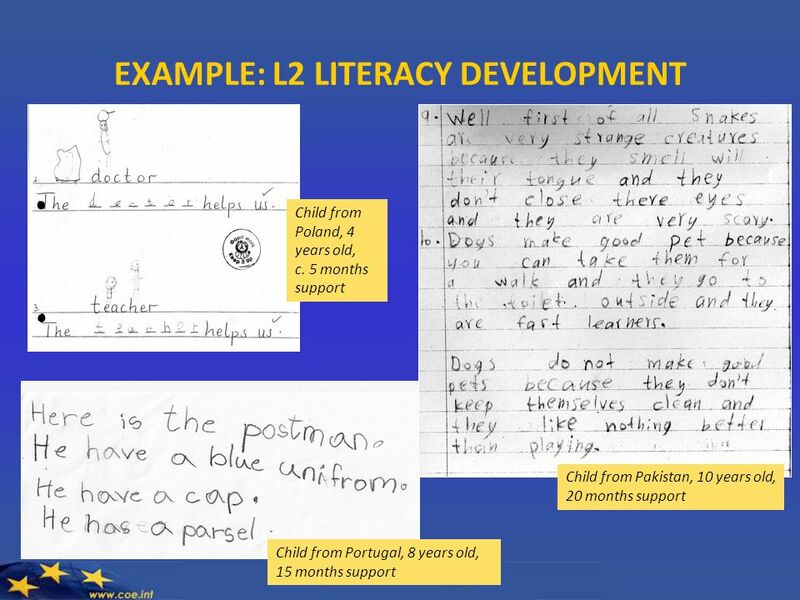 by a traffic warden). 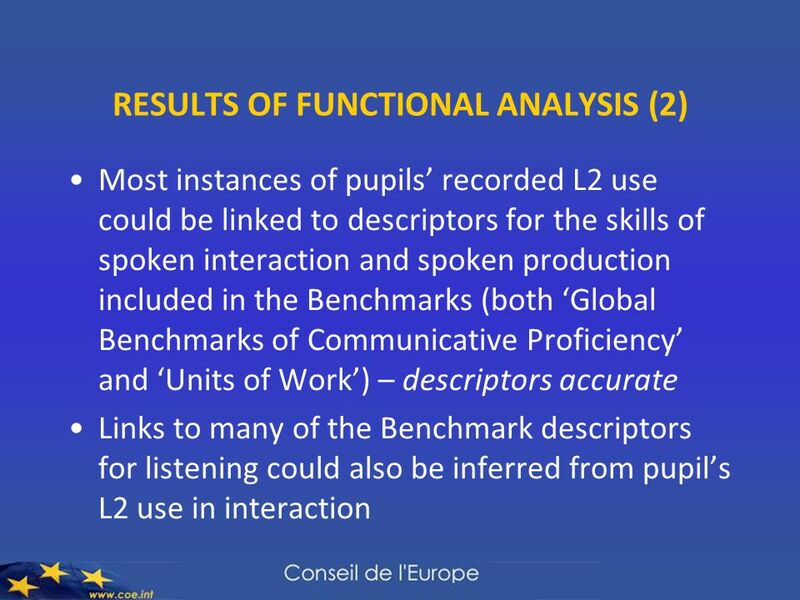 LISTENING - B1 Can understand detailed instructions in all school contexts (classroom, gym, playground etc.). 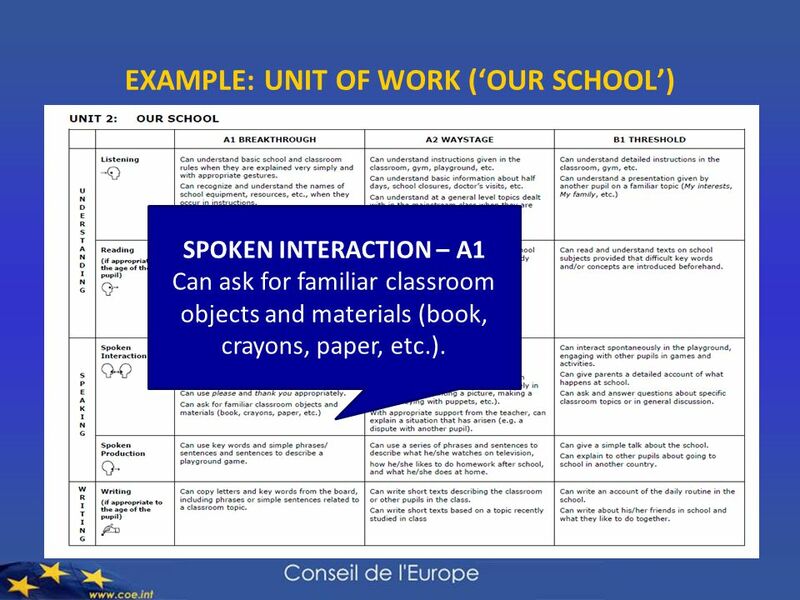 10 EXAMPLE: UNIT OF WORK (‘OUR SCHOOL’) SPOKEN INTERACTION – A1 Can ask for familiar classroom objects and materials (book, crayons, paper, etc.). 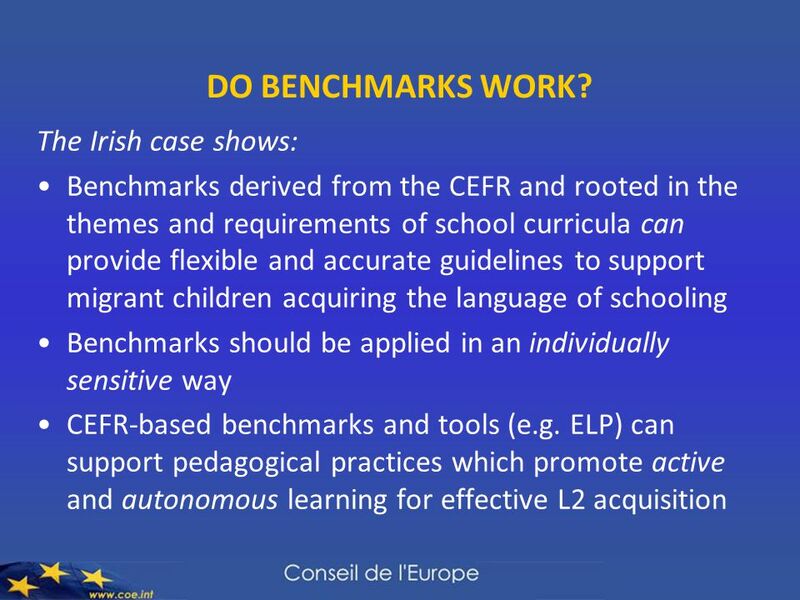 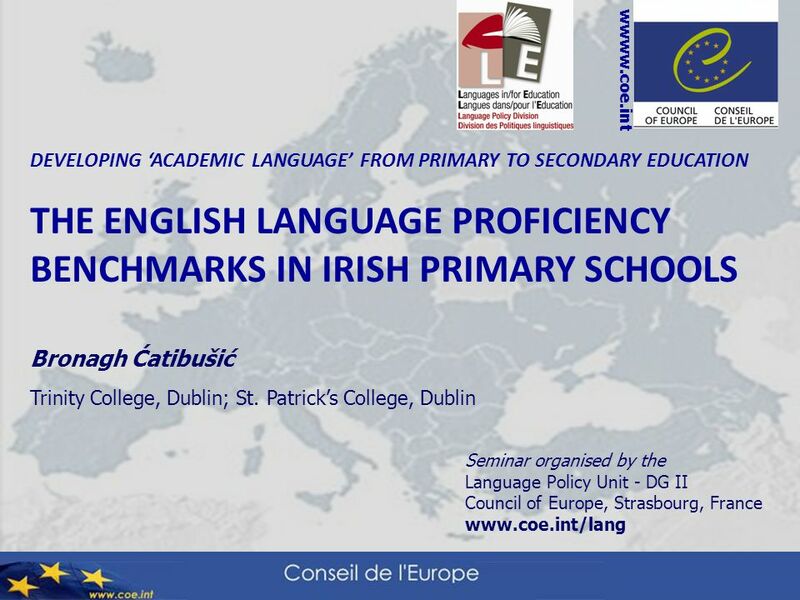 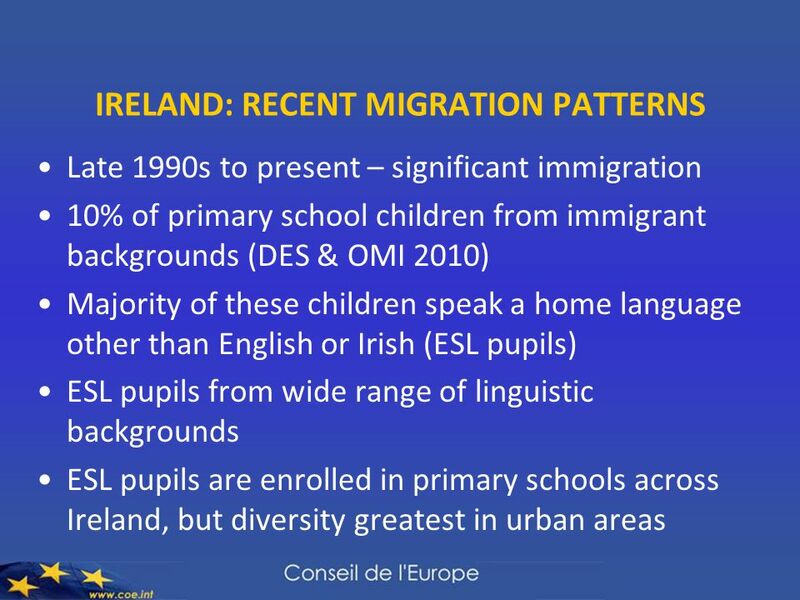 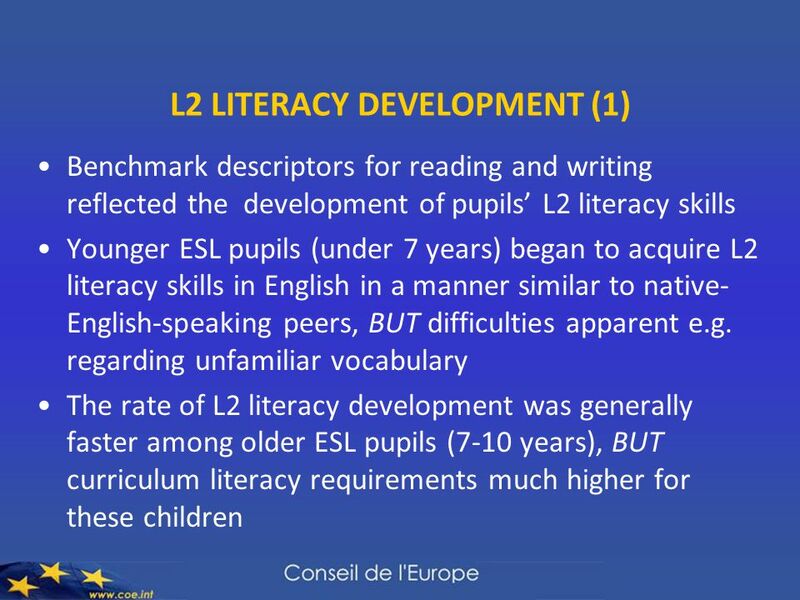 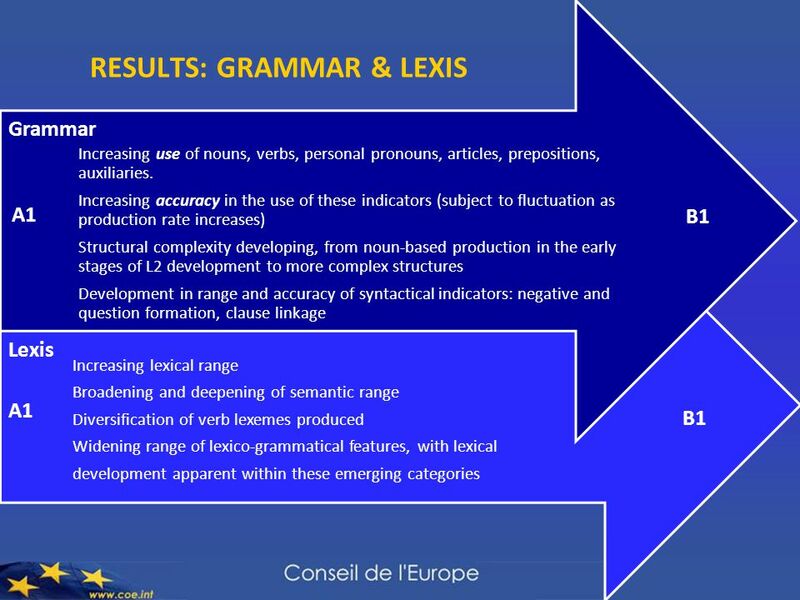 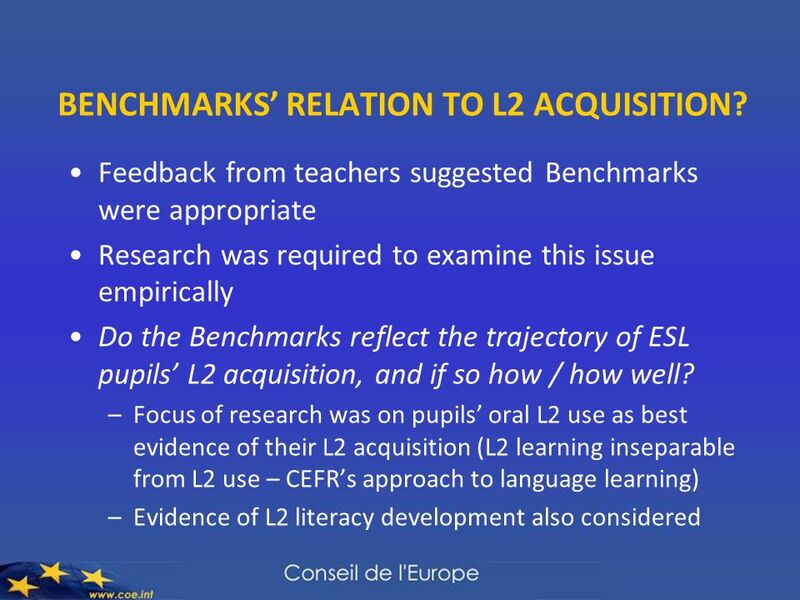 Download ppt "DEVELOPING ‘ACADEMIC LANGUAGE’ FROM PRIMARY TO SECONDARY EDUCATION THE ENGLISH LANGUAGE PROFICIENCY BENCHMARKS IN IRISH PRIMARY SCHOOLS Bronagh Ćatibušić." 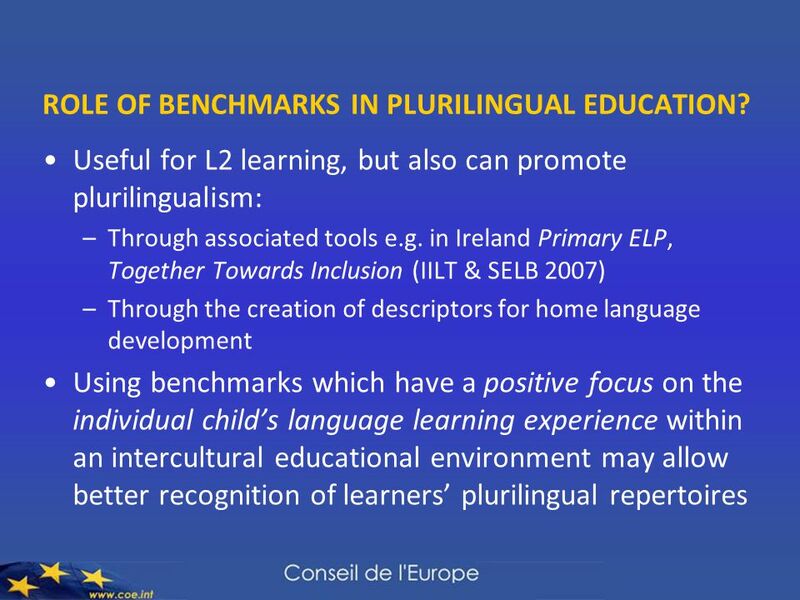 LEARNING IN 2+ LANGUAGES Ensuring Effective Inclusion for Bilingual Learners Training Materials. 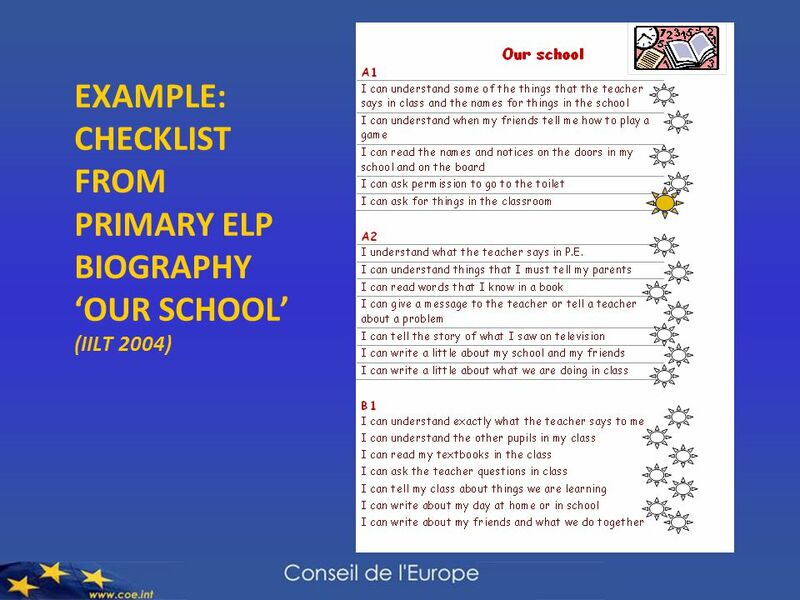 Assessment Assessment should be an integral part of a unit of work and should support student learning. 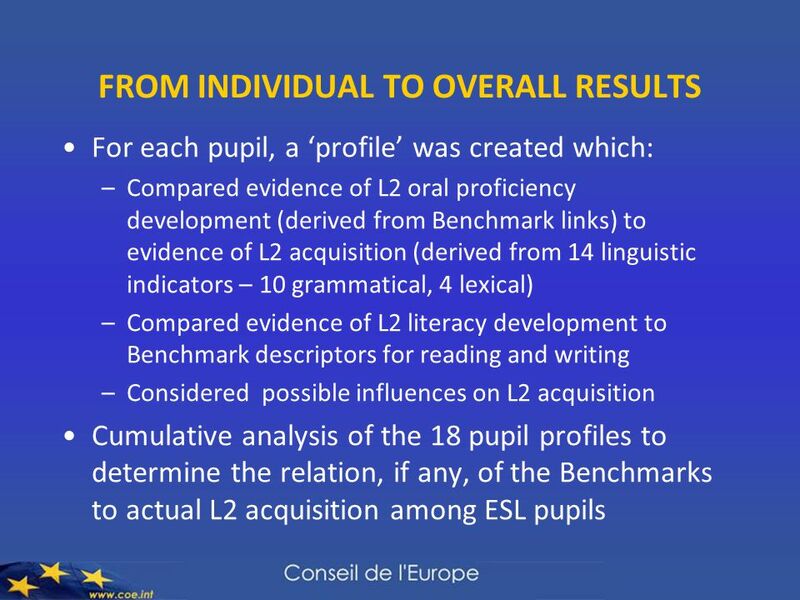 Assessment is the process of identifying, gathering. 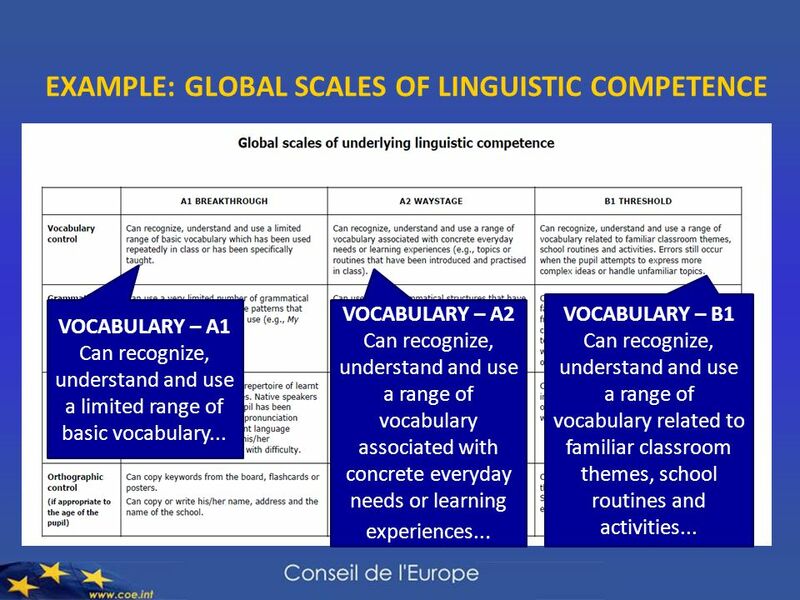 1.GENERAL INFORMATION 2.LANGUAGE LEARNING AND ASSESSMENT 3.COMPETENCIES IN LANGUAGE LEARNING 4.KVS GUIDELINES 5.INDICATORS OF ASSESSMENT 6.BLUEPRINT OF. 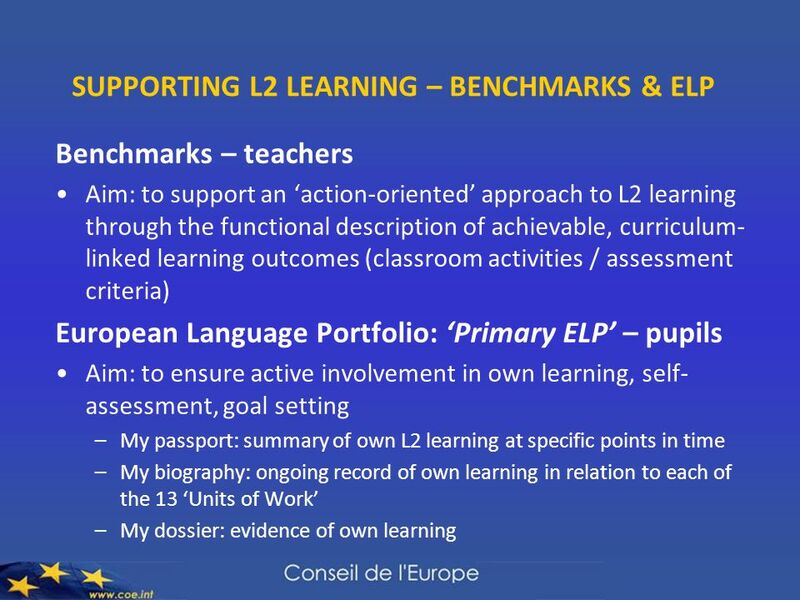 Assessment Information Evening Trinity School Enjoy Learning – Learning for Life. 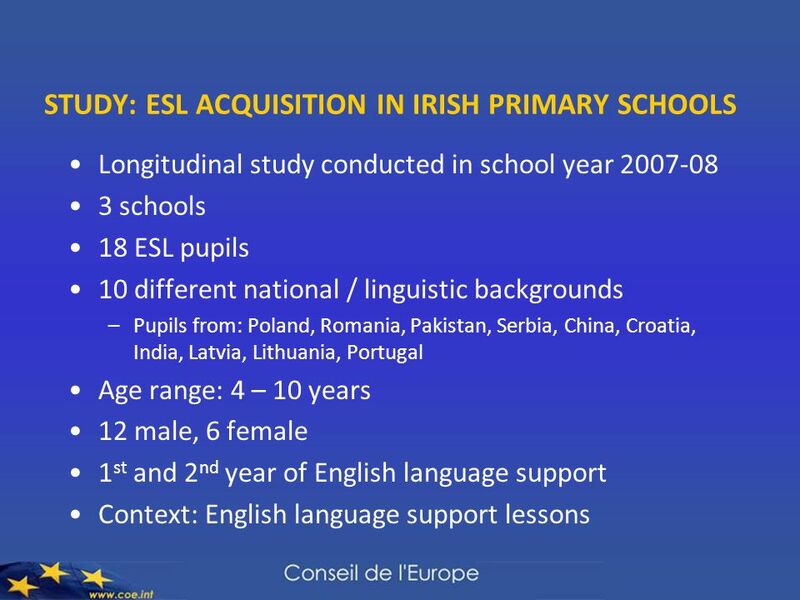 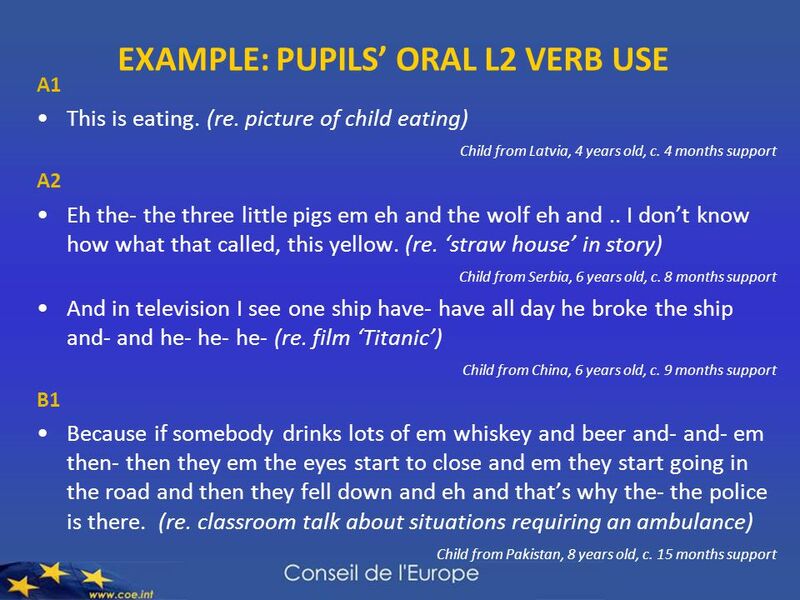 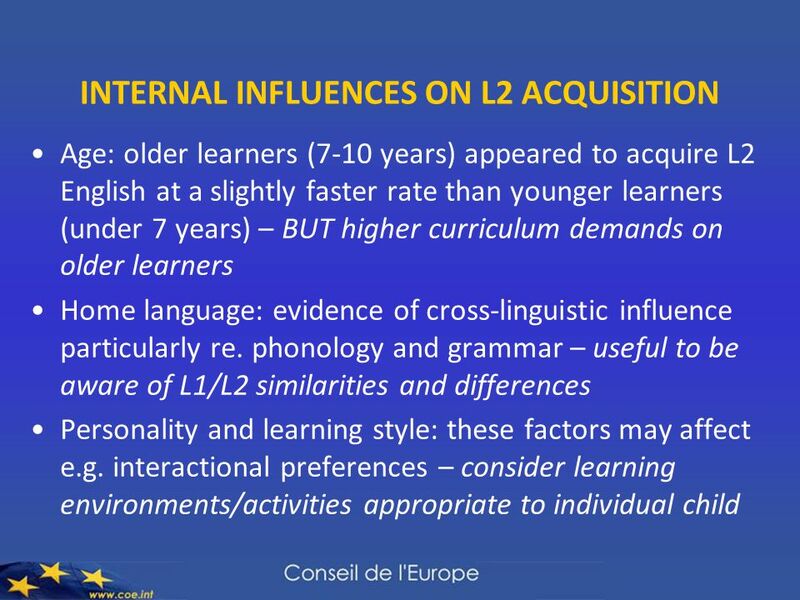 EAL in Primary National Curriculum Subjects. 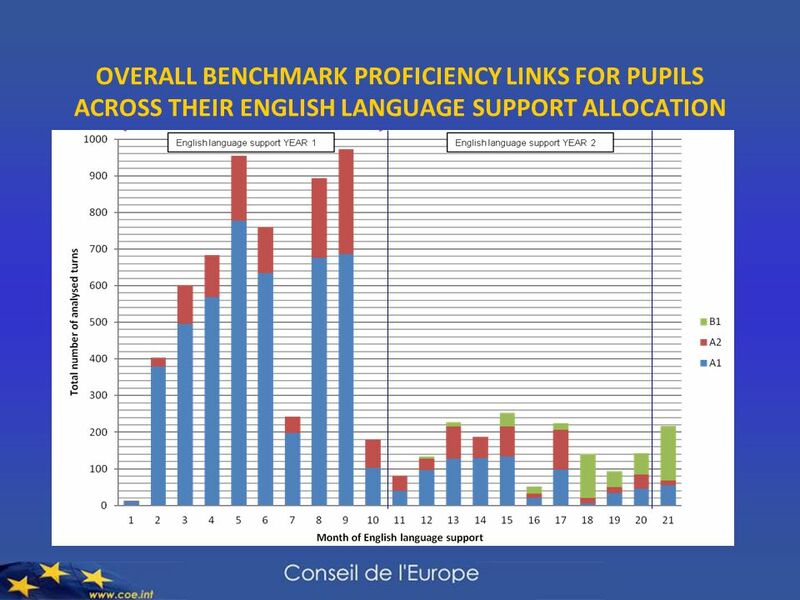 ©NALDIC ITE Support Materials EAL in National Curriculum subjects - Primary Aims of the session By the end. 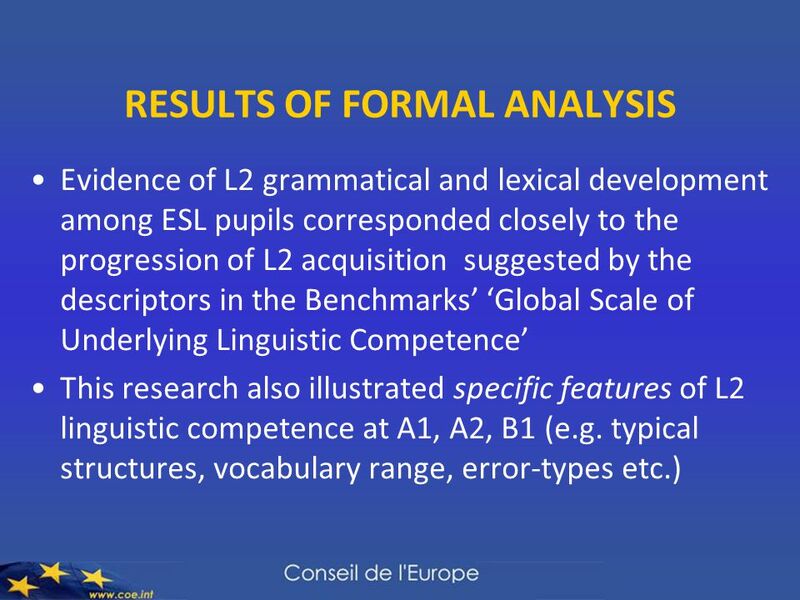 Constructing the Foundations of Capacity Building An Activity Theory Analysis of the English in Action Baseline Studies Jan Rae and Adrian Kirkwood. 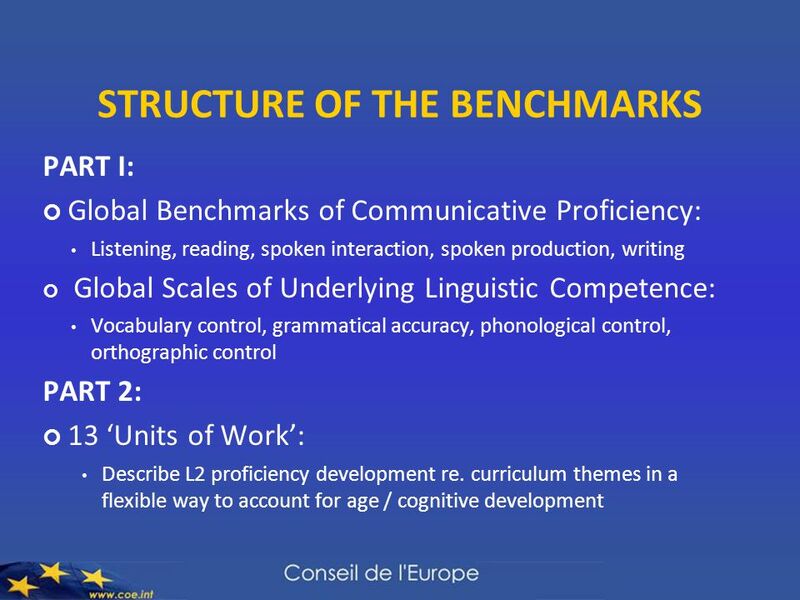 THE EARLY FRENCH IMMERSION PROGRAM Halifax Regional School Board INFORMATION SESSION 2015. 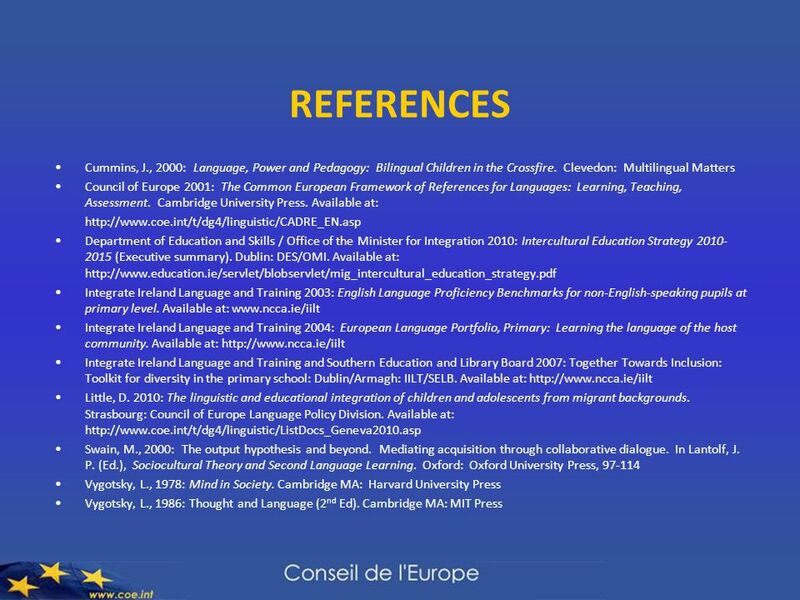 Dr Rachel Hawkes Secondary Regional Languages Conference Leicester, March 2014 Keynote. 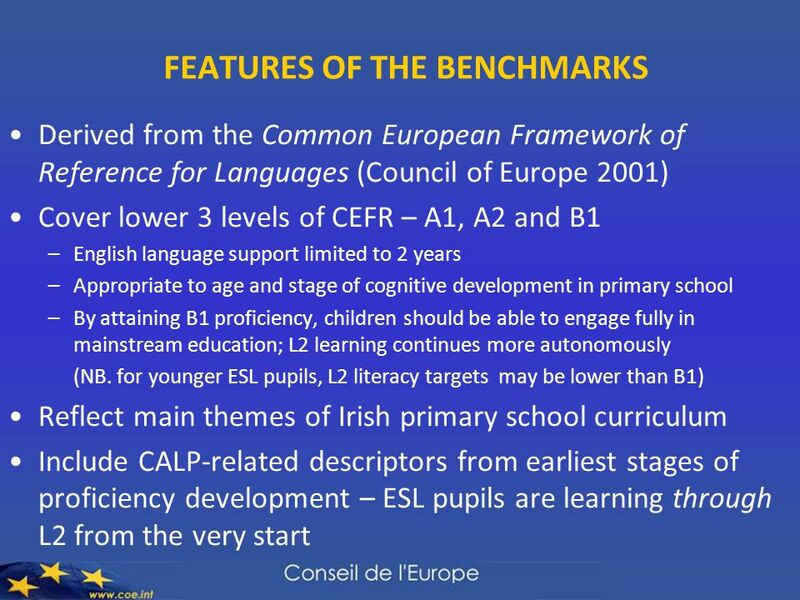 Curriculum Framework for Romani Seminar for decision makers and practitioners Council of Europe, 31 May and 1 June 2007 Using the Curriculum Framework. 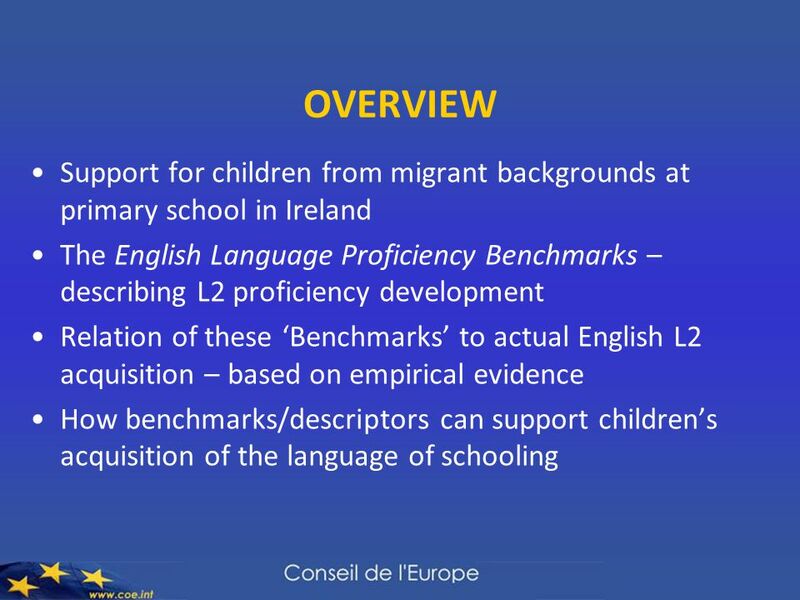 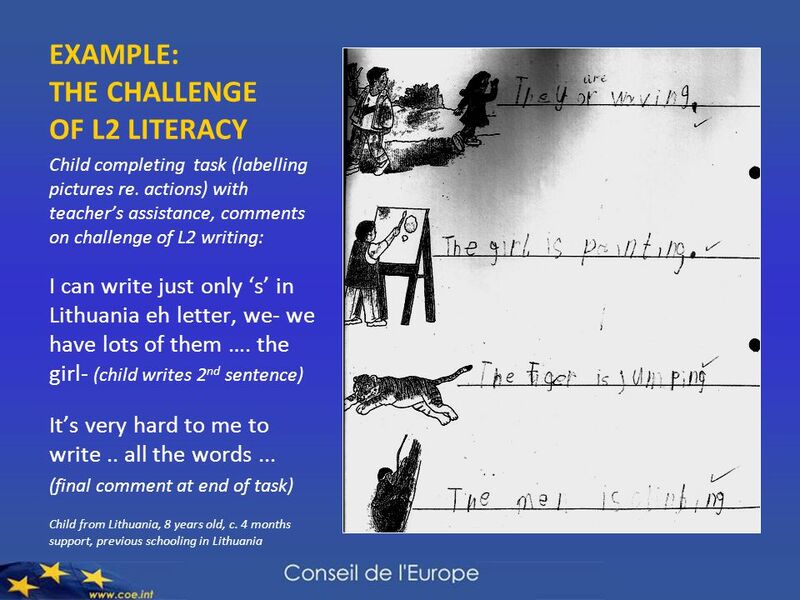 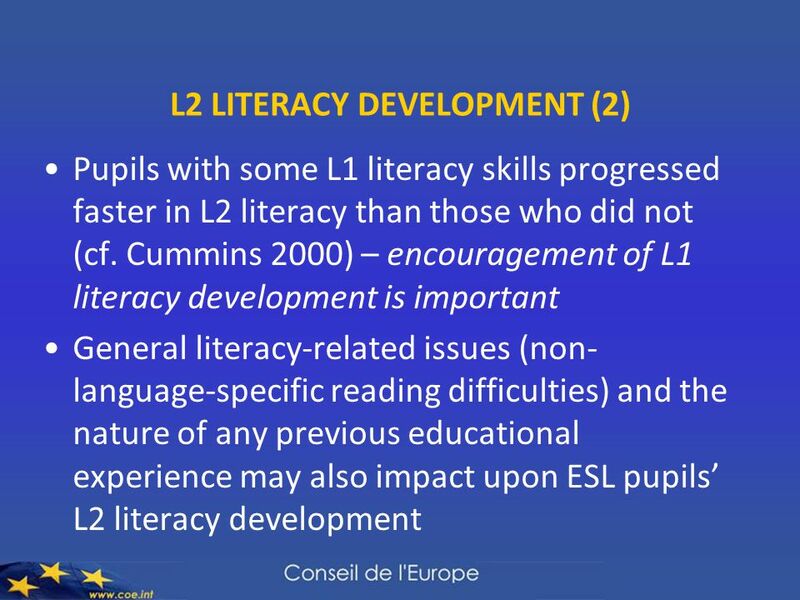 Language Policy Unit - DG II Council of Europe, Strasbourg, France wwww.coe.int Summing-up David Little Rapporteur. 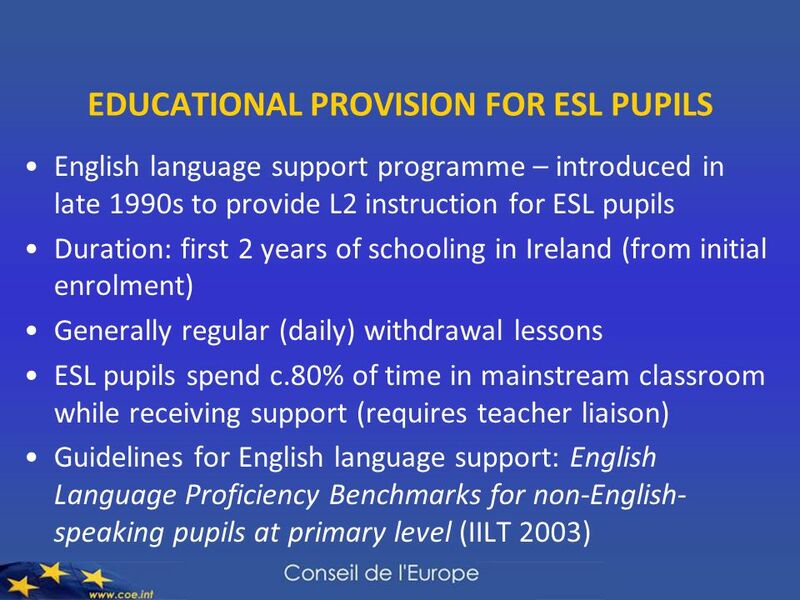 English as an additional language in ITE (4 th edition – 2010) Raymonde Sneddon University of East London.